A host of honours have been presented to staff members at a leading York hotel. And amongst those to receive an award at the DoubleTree by Hilton York was conference porter, Neil Hudson, who has clocked up 21-years continuous service at the St Maurice’s Road establishment. At the presentation ceremony held in the hotel’s courtyard café, two of Neil’s colleagues were also recognised for their length of service; Louise Thornhill, 15 years, and Darina Namespetra, 13 years. From the Food and Beverage department Adam Cameron, Abbie Nollar and Brittany Hamilton were all “Highly Commended” for completing a high amount of training since the hotel rebranded as a DoubleTree by Hilton following £6m worth of investment. Anna Hogan, Lisa Pearson, Bill Campbell and Tomasz Reszka were named “Emloyee of the Month” for January, February, March and April respectively. 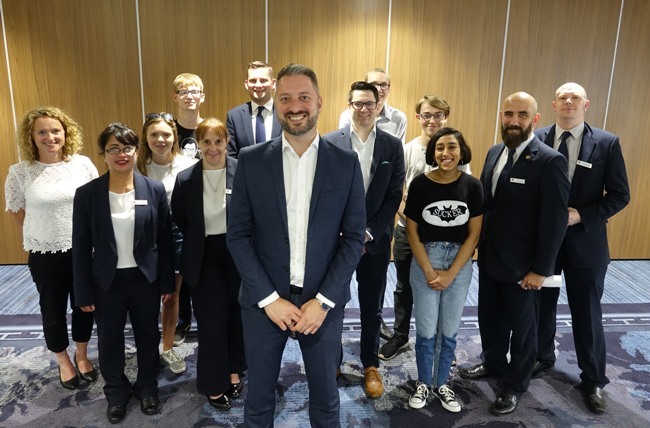 The DoubleTree by Hilton York’s general manager Graham Usher said: “Staff success is something we are very keen to celebrate here in the hotel. “I’m delighted that three of our colleagues have been awarded for their combined service of just under 50 years, which is a wonderful testament to both them and the working conditions here. “Since becoming a DoubleTree by Hilton, we have formed a staff-led Care Committee, whose role is to ensure not only our customer care is the standard it can possibly be, but to support colleagues and recommend them for reward when they have gone beyond the call of duty.